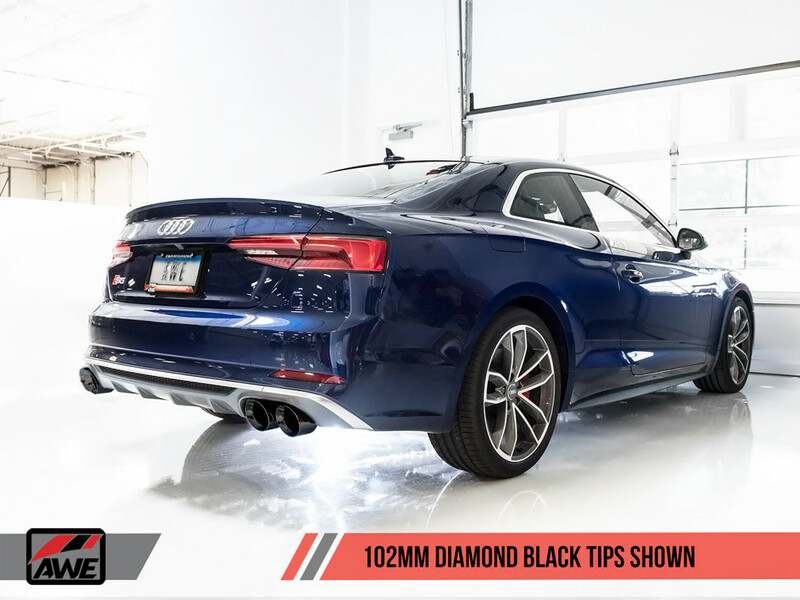 The AWE Exhaust System for the B9 Audi S5 is the perfect way to show the world your car is something special. With this exhaust you get a nice increase in power, aggressive rear styling, and a great exhaust note that touts the power of the Audi V6 powerplant. A good quality aftermarket exhaust is one of the main identifiers which separates the car enthusiast from the average car owner. Your exhaust becomes a part of your identity, enthusiast friends will recognize your approach and associate that sound with you and your car. When choosing an ehxuast it is important to think about what you want your exhaust to say about you. If you're a very modest person who wants your car to sound nice without too much fuss then we recommend the AWE Touring Edition Exhaust. 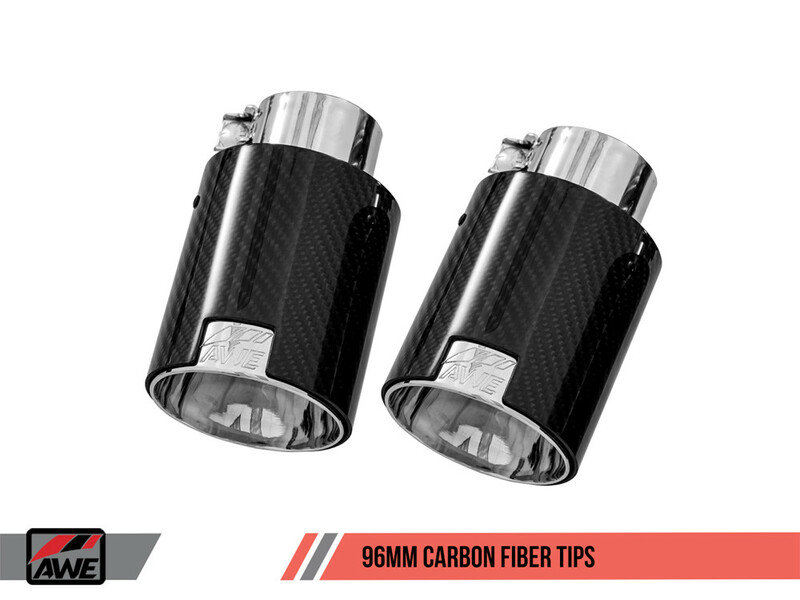 This exhaust has dual resonators in the front and at the back features two special AWE Mufflers with 180 Technology. Their 180 Technology uses strategically placed baffling to eliminate drone so you get a smooth exhaust tone without annoying resonance in the cabin. Under heavy acceleration you still get a good bit of volume along with the fun pops and crackles you'd expect from a performance exhaust. If this isn't quite what you're looking for check out the AWE Track Exhaust or the AWE SwitchPath Exhaust. Along with sound one should also consider performance and visual improvements. 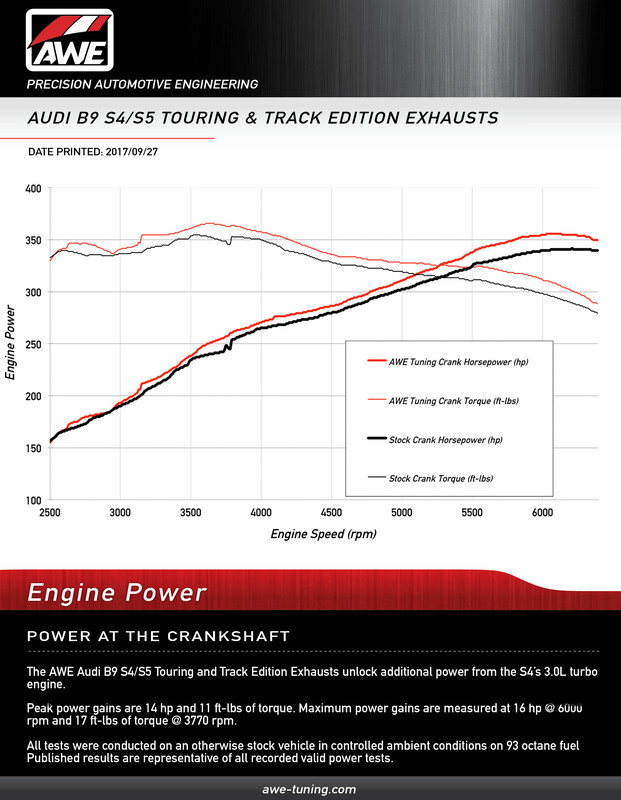 The AWE S5 Exhaust has been dyno tested and shown to give peak gains of 14HP and 11 ft-lbs of Torque with max gains of up to 16HP and 17 ft-lbs or Torque. This gives you improved passing power and smooths out the torque curve in the midrange (most used) rpms. 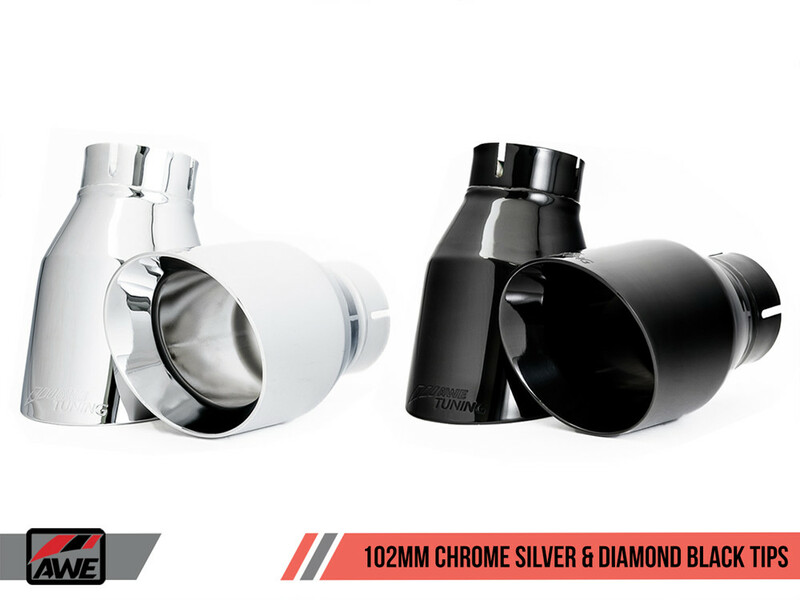 To give a more aggressive asthetic AWE offers multiple exhaust tip options so you can customize your look to match your style. 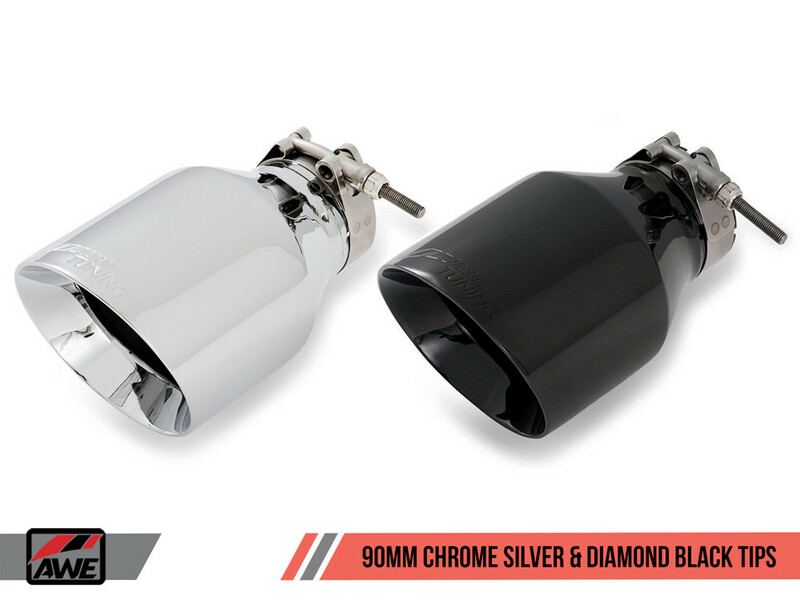 You can choose smaller 90mm silver tips for a look closer to OEM or you can go for the large 102mm diamond black tips to really stand out. 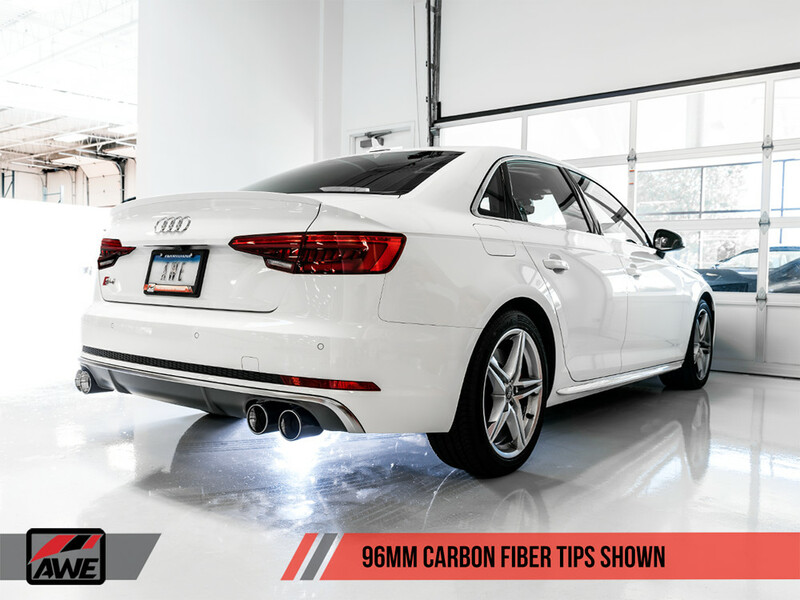 You can't help but turn heads with this exhaust system, and with the added performance and style it's the upgrade your car has been hoping for.